It sold out almost as quickly as Westlife and there have been calls for additional dates! After long negotiations with key delivery partners, some additional places were made available by the race committee, making this the largest field in the events long established history. Consequently, record number of teams will take to the start for the 35th Castlewellan Christmas Cracker pairs’ race on Saturday 29th December at 1pm. The market town will be awash with colour as almost 1500 competitors, many of whom will ‘dress for the occasion’, take to the streets. 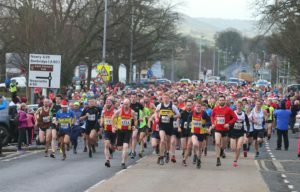 The race has grown exponentially since it was taken over by Newcastle AC and relocated from Comber to Castlewellan in the early ‘noughties’ and remains one of the most unique and popular races in the annual ANI calendar. Building on the success of previous years, there are more mixed teams and more all-female teams. I recall clearly the 2004 race when there were 54 teams finishing. This stands as irrefutable evidence of the amazing popularity of running at present and the desire among athletes of all abilities to get out there and compete. For some it will be to win a category (some individuals carefully select a partner to maximise their chances in an age category – all perfectly legal!) or record a fast time, while for others it will be the joy of finishing and the sense of accomplishment that comes from simply being able to say, ‘I did it’ and proudly wear the bespoke finisher medal. Check out our 2017 Christmas Cracker Medals! Every team who takes part will receive one of these bespoke medals. We’ve nearly reached 400 entries, so get your entry in now! The Greatest Cracker of Them All?